The Jackdaw (Corvus monedula Linnaeus, 1758) belongs to the order of the Passeriformes and to the family of the Corvidae and is the smallest and the most elegant and gay membre amongst its congeners. To these morphological characteristics we have to add the particular docility that this small crow displays towards the mankind, with which it often shares the territory, place nowadays invaded by the Rock doves (Columba livia) of whom it is the most bitter predator. The jackdaw has however some major shortcomings, among which stands a such settled and congenital vice to become irresistible and irrepressible whenever the occasion arises. Often we speak of the cruelty of the hooded crows (Corvus cornix) in plundering the nests of other birds for nourishing its own progeny and of the nasty habit of the common magpie (Pica pica) to steal and hide shiny objects, so much to be called thief. Well, there is no bird more interested than the jackdaw, in collecting shining things, even insignificant, and to take them and hide in other places. A capacity even more marked than that of the common magpie, so much to reflect negatively also in its scientific name. 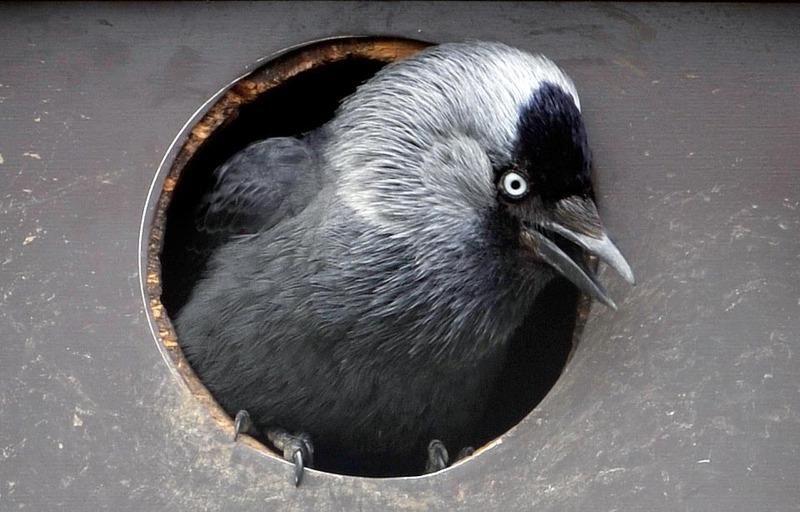 With regard to the predation of others’ nests, nobody is more shrewd and avid than the jackdaw, so much to be considered as the welcome when it begins to nest on some bell tower or in scaffolder holes of old city buildings, as it is a good predator of the population of pigeons that now invade and damage our cities. Being small, rapid and light it seems to render these operations lovelier, as if they were simple pranks, instead of real thefts and robberies but actually it is terrible, relentless and implacable in persisting in its bad habits. It is also very social and this union with its similars renders it even stronger and prevaricating towards any neighbour. 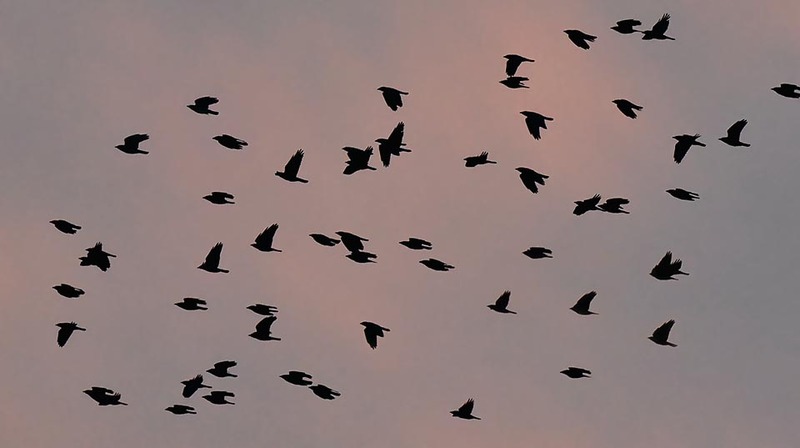 Being a corvid, it often cohabits during the period post nesting with the congeners, while looking for food as well as in the dormitories, even if it always maintains a certain distance. The etymology of the genus Corvus has origin from the homonymous Latin term that rightly means crow, derived in its turn from the Greek term “krozo”, always with the same meaning, whilst the species monedula comes from the Latin “moneta” = money and “edo” = to eat. A quite odd and without any logical meaning classification if it should not derive, as often is the case for the scientific names, from the old Greek mythology. Linnaeus, thinking that among the vices of this bird there was that of gathering and stealing the coins, looked for a relation with the old legends and actually did find it. The Athen’s noblewoman Arne, after having betrayed for money her own homeland in favour of the king Minos of Crete, was punished by the gods for her greed and, furious, they transformed her in a magpie or in a jackdaw, birds that have rightly maintained the same greediness. Also the genus Coloeus, where now many taxonomists place this crow, has a Greek etymology as it comes from the term “koloios” = small crow. Conversely, “taccola” has, like many Italian vulgar names, an uncertain etymology even if it probably comes from “tacca” = shortcoming, defect, bad habit, to indicate the capacity this bird has to commit every kind of folly. The English Jackdaw comes from the combination of the old jargon “daw” = given to this small crow and “jack”, little, to identify its size. 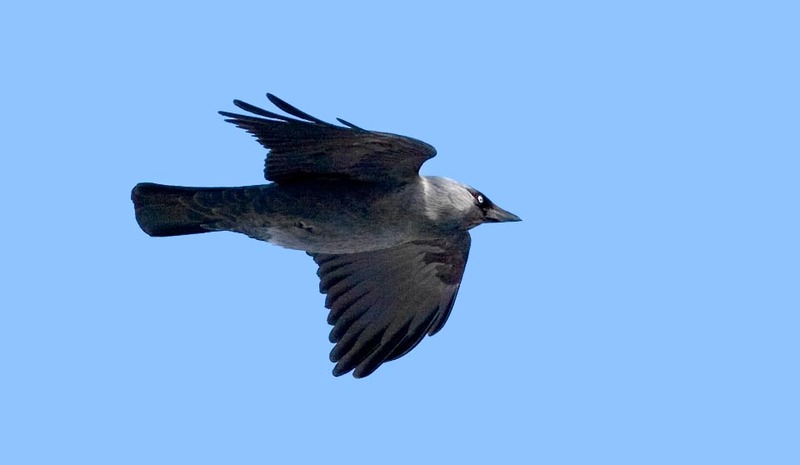 Other international common names are: in English, Eurasian Jackdaw; in German, Dohle; in Spanish, Grajilla occidental; in French, Choucas des tours; in Portuguese, Gralha-de-nuca-cinzenta and an unthinkable Nishikokumarugarasu in Japanese. Odd is the strange combination of the jackdaw to the Czech writer Kafka, on whose letterhead the father put a logo with represented rightly a jackdaw perched on a branch, as if it were an emblem of an alleged lineage. The combination came from the fact that the common Czech name “kavka”, given to this bird, corresponded in the pronunciation to his family’s name. The jackdaw did rise in popularity and went down in history by the hand of the most important scholar of ethology of the last century, Konrad Lorenz, as it was the publication of the book written when young “King Solomon’s Ring”, about the behavior of this bird which brought him some decades after to the fame and the Nobel Prize with the enunciation of the imprinting theory. 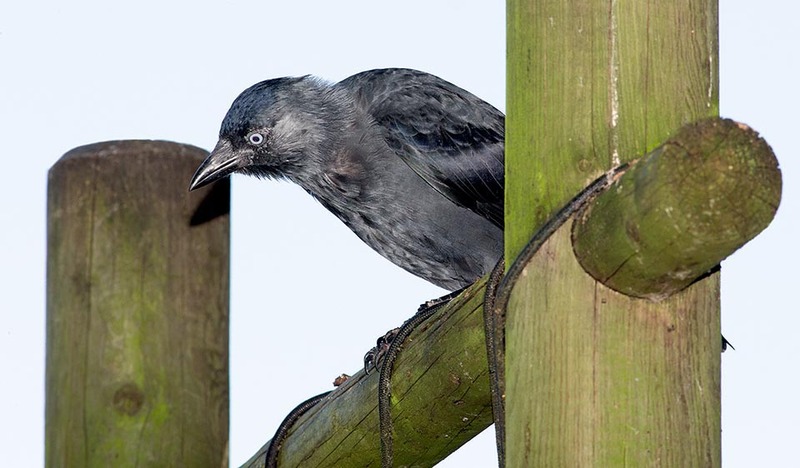 The jackdaw occupies diffusely all continental Europe up to the extreme south of the Scandinavian Peninsula and through Russia and the central-Asian republics, up to touch Mongolia and western China. It is present also in the Middle East but not in an extensive way and in Africa, on the Mediterranean coasts from Tunisia to Morocco. Most of the populations are resident and keep in the same territories also during the winter, excepting some fast seasonal short-range movements that lead them to gather in more suitable areas where to spend the bad season. Conversely, the populations at the extreme north of the Euro-Asian range are migratory, they totally leave the territories and reach the Mediterranean areas, the Indus valley and the northern part of Persian Gulf. Its high sociality is evident in this season when can take form consistent flocks in particular in the common roost. 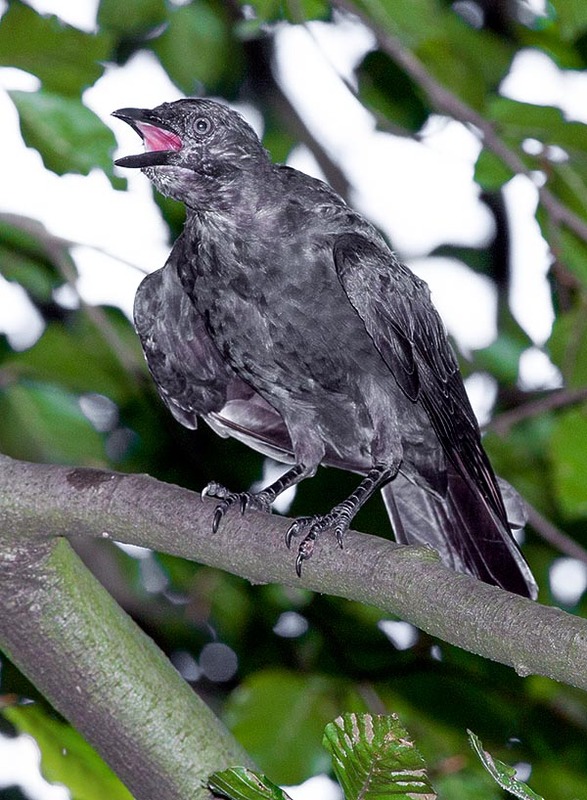 The jackdaw is replaced in the territories at east of its range and up the Pacific coasts, by the congener the Daurian jackdaw (Corvus dauuricus) very similar in the behaviour as well as in the livery. 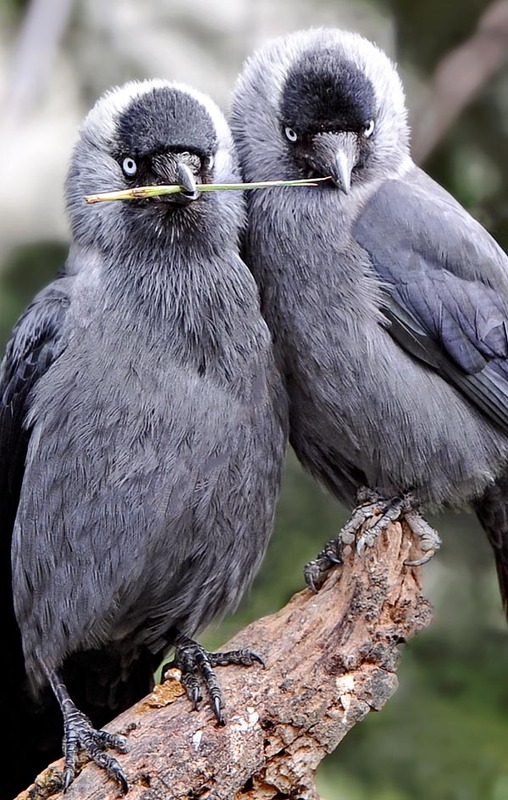 The jackdaw is a very intelligent bird possibly even more than its congeners. It has an innate curiosity higher than the big crows and that approaches much more that evidencing the magpie that already results in excelling among these ones. This capacity places it in the condition of easily accepting the most varied habitats, including those shared with the human being. Once relegated to cliffs and sheer rocks above the sea or impervious valleys or between the battlements of ancient castles, environments that still now it loves to frequent, has become more and more often a city bird finding in the old mansions and in the high belfries a habitat similar to those formerly inhabited. 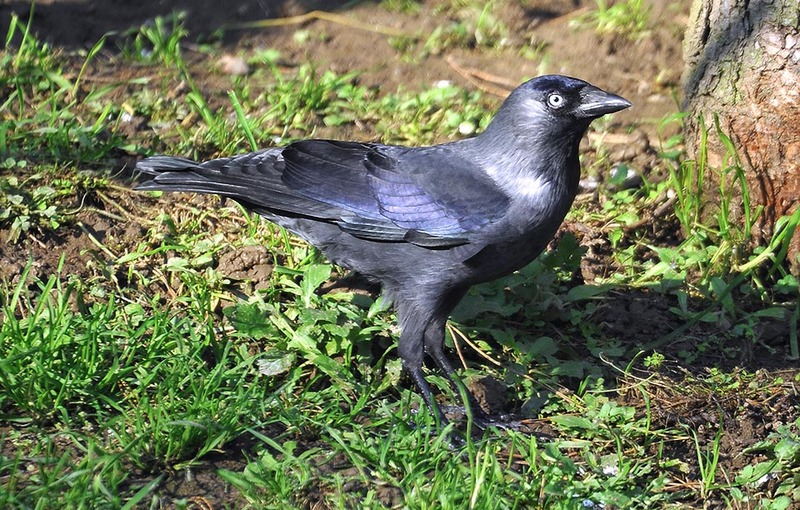 It is possible that this choice has been motivated by food opportunism seen that, as we shall see, the jackdaw is practically omnivorous and in its vast dietary menu has taken advantage ot the very strong increase of the city populations of Rock doves (Columba livia) of which it exploits the accentuated prolificacy and of the wastes inordinately produced by the man. Also the new city structures that see the abandonment of old buildings in favour of more modern dwellings, have contributed in widening their habitats leading them to civilize areas that before did not offer any place for nesting. Similarly, the industrial sheds sprung out in the suburbs of large urban centers, have often become one of their new shrines. Nowadays, every bridge, every overpass or highway viaduct, whatever is its height from the soil, has its colony of jackdaws now permanently settled. It does not disdain the next boxes placed in public spaces for attracting Little owls (Athene noctua) and Tawny owls (Strix aluco), Stock doves (Columba oenas) and Kestrels (Falco tinnunculus) and that with great skill but also with the help of the members of the colony, manages to steal cleverly. The Corvus monedula does not love forests or thick woods but prefers areas even treed but with ample clearings and meadows where to get food. In North Europe the farms are their choice habitat for living there permanently throughout the year as well as for getting there daily looking for food. The jackdaw is a little crow smaller than a pigeon but who keeps in the attitudes and the colours the typical posture of the big members of its family. It is about 35 cm long, weighs 250 g and has a wingspan of 65 cm. The livery for both sexes is practically raven black, with a hint of greyish on the neck and on the nape wisible only at short distance. 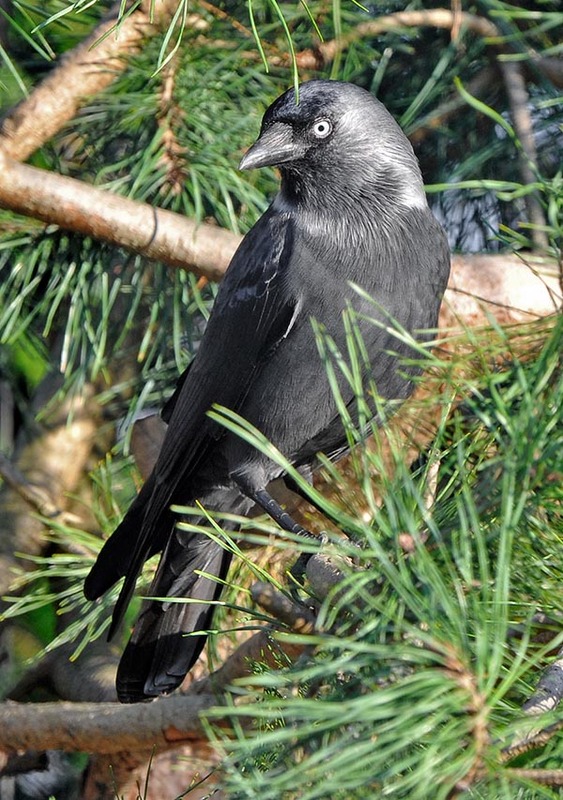 This ash grey part is replaced by a much more whitish shade in the congener Daurian jackdaw and is the only particular that differentiates it even if in the areas of contact of each other’s territory we can assist to frequent hybridizations with specimens displaying intermediate shades and of difficult interpretation on the field. The young are much more greyish on the lower part of the body but also on the covert and do not display so clearly the collar, distinctive of the adults. The eyes are of pearl colour and though the chicks stand out even from far away like a very clear and shiny spot on a very black livery. Conversely, in the youngs they are initially light blue and get the pearly colour only with the increasing age. Robust and strong bill but not much prominent and very black legs too, slender and highly nailed. It is a very talkative species and easy to distinguish from the congeners due to the popping sound of its usual cry, a “kiok kiok kiok” that emits continuously as contact message during the flight as well as social vocalization in every moment of the day. A habitual and well known sound in all the cities of central-northern Europe but also in the Mediterranean area where, though reduced in the number, is increasing its presence. Some subspecies have been determined but in their turn are subject to intra hybridization in the areas located at the boundaries of their territories and that display a more or less accentuated presence of the typical grey collar. Corvus monedula monedula of the eastern European part and up to Scandinavia, Corvus monedula spermologus of central-southern Europe and of the Iberian Peninsula, Corvus monedula soemmerringii of Middle East and through central Asia, up to the eastern limit of the range and Corvus monedula cirtensis that occupies the African range. The jackdaw is, like the Rook (Corvus frugilegus) a very social bird and spends all its life inside very close-knit and united colonies. Also during the nesting, even if trying to reserve the space strictly necessary for its privacy, it cohabits in the colony fixing the due distances between the nests but sharing the same environment. Organization typical of birds that nest on reefs, on towers and walls or places that need a close coexistence often due to a pact of mutual aid and defense of the community. The species is strongly monogamous. The nest is placed inside fissures or cracks in the rock, in cavities of trees or in niches on old artifacts and consists in a messy heap of small branches that gradually get smaller to form inside the platform a soft cup covered by small roots, feathers, wool and animal hairs. The typical modality of construction of the nest by this corvid, is unluckily cause of damages to the housing structures. Once found the hole, the jackdaw begins to throw twigs of a certain thickness to block its bottom, thus to be able then to build a solid platform for the nest. Unfortunately, at times the holes cannot always be filled, as is the case of the hood chimneys, with consequent blocking of the passage of the smokes and thus resulting in extraordinary maintenances. This further malpractice of the jackdaw, was mentioned in an old English funny story where they were talking about the concession made by the prelate to the sexton, for carrying home all what the jackdaws brought on the bell tower. The sexton rejoiced saying that among the many wastes he had collected “two nice carriages of good wood to burn in the fireplace”. 5 to 7 light blue eggs reddish spotted are laid, brooded by the female only for 18 days and the chick keep in the nest 5 weeks more before fledging. The birth of the nestlings is contemporary as the brooding begins only after the deposition of the last egg and therefore all the members of the same brood have practically always the same age and size. Once abandoned the nest, the parents still assist the chicks for various weeks more until the complete autonomy. By laying only one brood the parents have the material time to follow for long period the growth of the progeny, keeping practically united for the whole reproductive season. As mentioned, the species is monogamous for the whole life and the accidental loss of one of the two partners causes a real familiar tragedy as this deficiency often generates the loss of the rights that each reproductive member has acquired inside the colony. The widower/widow will always live in the colony but in a marginal position and without the rights and powers it had before. The jackdaw nourishes opportunistically of all what is edible. 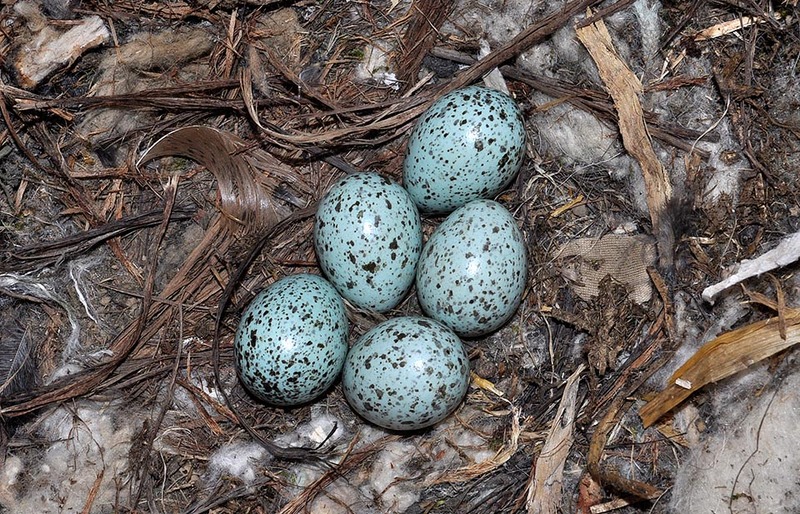 To loot the eggs from the nests is one of its innate passions and with a such substantial food is able to afford periods of relative abstinence. It eats small invertebrates, especially cockroaches, beetles, their larvae and pupae but also moths and dipterans. It does not disdain carrions, small nestlings and rodents, reptilians and amphibians, snails and even if strictly linked to the organic material, eats usually also spontaneous seeds and cereals, wild berries and cultivated fruits. Of course, the nesting period implies a total exposure towards the first foodstuffs. 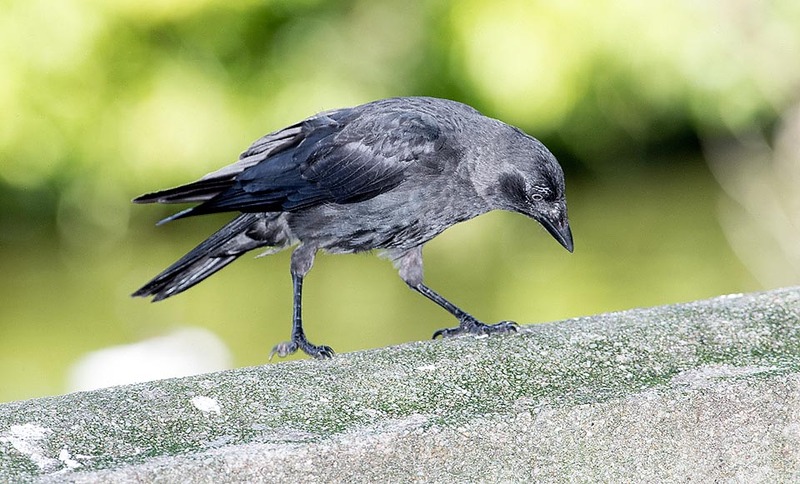 Like many birds, also the jackdaw boasts an endless series of tales, funny stories and more or less important traditions, gleaned over the centuries and referred to the more or less benevolent interpretation, due to its manifold behaviours. Here is one last anecdote concerning this bird so much linked to the ecclesiastical buildings where often finds shelter and indirectly to the clergy living there. William Cowper, famous poet and jurist of the XVIII century, known for his aphorisms and for a certain satirical vein of his poems, author of the famous saying “A noisy man is always in the right”, in this regard wrote a brief sonnet that equates the assiduousness in attending the churches by the jackdaws to that of the priests living there. “A great frequenter of the church, where bishop like he finds a perch. And a dormitory too”. It is not an endangered species. → Per apprezzare la biodiversità dei PASSERIFORMES cliccare qui.